Thread lifts use sterile threads inserted underneath the skin to produce a mechanical lift to the face and neck area. Suitable for both men and women who are starting to see heaviness in the face associated with ageing, thread lifting can be used to target the brow, cheeks, jawline and the neck as appropriate. They can also be used to stimulate skin tightening in other areas such as the stomach, arms and thighs. Instead of removing loose skin, a tread lift involves suspending this skin by stitching up portions of it. Thread lifts have the effect of pulling the skin back which results in lifting and tightening the skin. Over time, thread lifts also have the added benefit of gradually stimulating collagen production which helps to restore facial volume and smooth out deep lines and wrinkles. This process provides patients with an ongoing and progressive rejuvenation for their facial tissue. Thread lifts are a relatively simple treatment that delivers a natural looking lift to your face and results in a fresher, rejuvenated look. If you want to find out more about our thread lift treatments or to book an appointment, get in touch with the Illuminate Skin Clinic in Kings Hill, Kent today for an initial consultation with one of our thread lift specialists. The threads are inserted using a cannula that is fed through a small hole in your skin made with a sharp needle. When the cannula is removed the threads remain, creating the desired lift. WHAT HAPPENS DURING THE THREAD LIFTING TREATMENT? Your skin will be carefully cleaned prior to treatment. Dr Sophie may also draw on your skin to mark the area being treated. Local anaesthetic will then be injected. At the end of the treatment, antibacterial ointment will be applied and the tiny needle holes made will be covered with small spot plasters. Pain may be felt during the injection of anaesthetic, a little like injections at the dentist. When the anaesthetic wears off some discomfort may also be felt. Swelling and sometimes visible bruising may also occur. WHO IS THREAD LIFTING SUITABLE FOR? Anyone aged 18 and over. 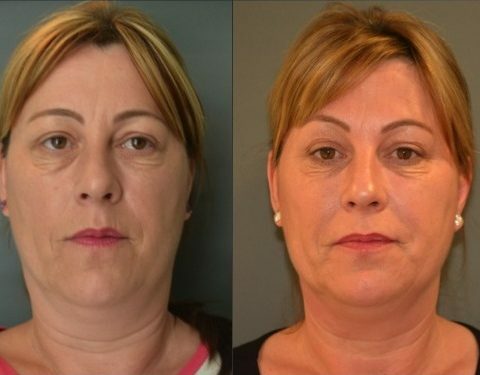 Thread lifting is particularly effective in treating jowls or heavier marionette lines.